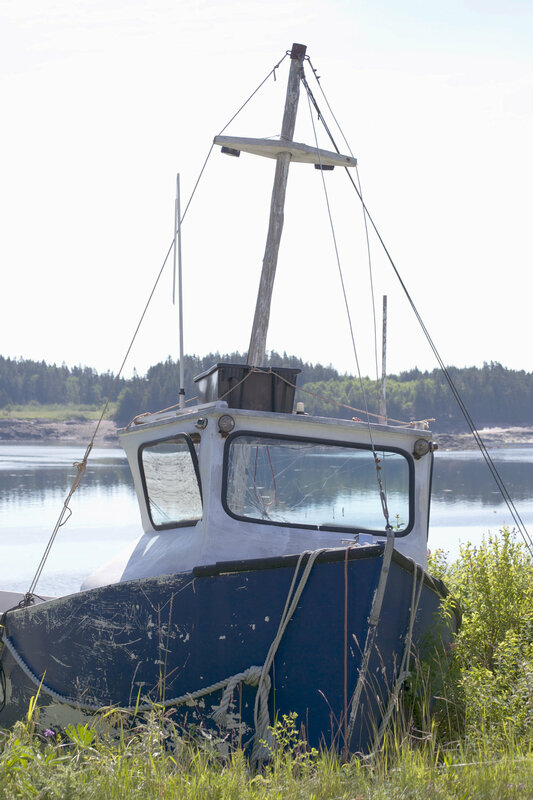 Deer Island, halfway between the Equator & North Pole, is a wee jewel in the Bay of Fundy. 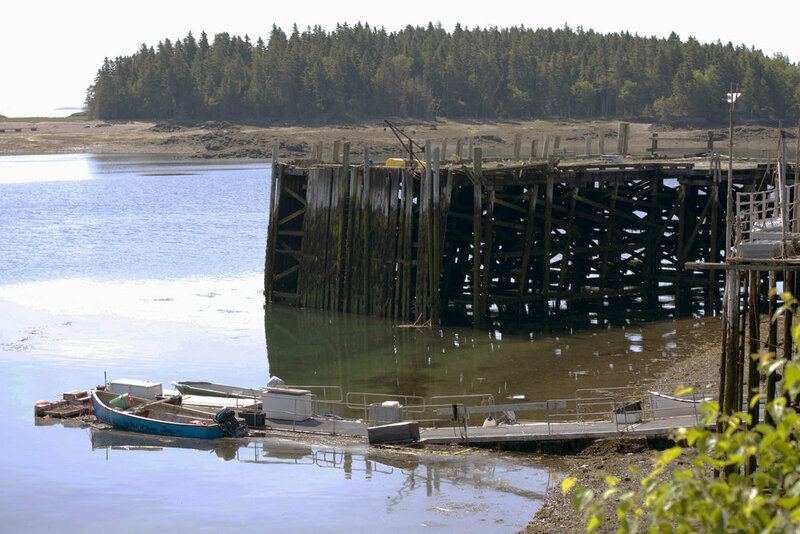 It is a hidden gem for sure, as many Maritimers I ask, say they have never been. Don't make the same mistake and miss the chance to explore this rural, rugged, natural beauty. Maritimers, I was once like you having not been, but I am hoping after reading this story, you will want to go too! Treat yourself to a dawn to dusk adventure, or stay for a day or two ~ or perhaps go longer. 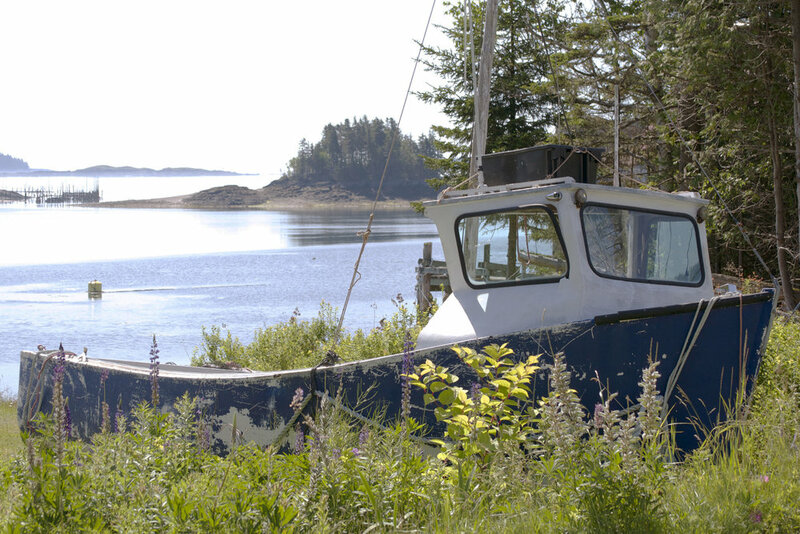 Unplug and discover what getting back to nature really means on this sweet little Bay of Fundy isle. Residents, all 1000 of them, are welcoming and happy to share their island. My husband surprised me with a wonderful day trip adventure to Deer Island, and upon our return (and a little research), I realized I need to go back to capture even more of this beautiful place. It's Called Deer Island for a Reason! 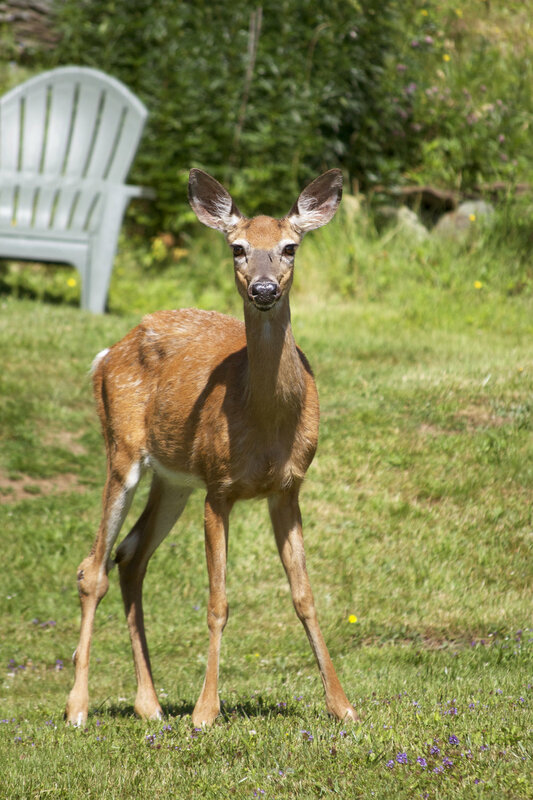 Drive slowly and keep an eye out for the other residents inhabiting Deer Island. Deer seem to enjoy free range here; they are everywhere! See them foraging for a meal over hill & dale, and lawn & garden (from what I saw). It made me giggle delightfully watching them in backyards and poking into flower & vegetable gardens. The residents don't seem to mind much, so please be careful to preserve this happy relationship they both enjoy by being watchful on the roadways (for the animals' safety & yours). It is lovely to see these exquisite, beautiful creatures all over the island. Enjoy the experience. My husband is learning patience as I can't resist an abandoned fishing vessel, but he didn't seem to mind as there was always a beautiful view to take in, whenever I got caught up in my photography on Deer Island. Artists would think they had gone to heaven here too. May I suggest a 'Paint Deer Island Day' every summer, New Brunswick Tourism Peeps?! It would be heavenly and a great fundraiser! 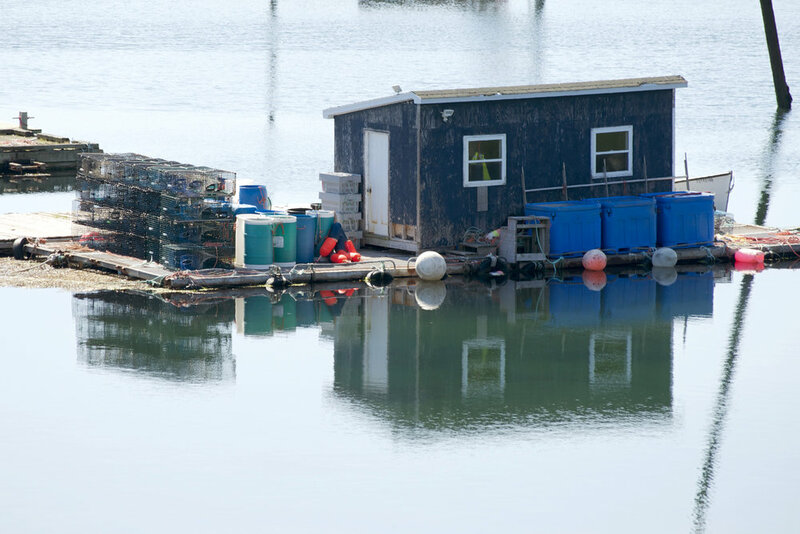 Fishing and aquaculture are the main industry here as is evident by the abundant fishing boats and fishing weirs. Lobster pounds are plentiful too, as these seafood crustaceans are held here until shipped elsewhere. Photographers, artists, deep sea divers, whale watchers, birdwatchers, nature lovers, hikers, bikers, kayakers, beachcombers, campers and sightseers must make up the rest of the economy's supporters, as there is so much here for these souls. There are a few places to show your appreciation to support the local economy. You can stay overnight at the one motel or camp at the only campground. There are a few cottages and B & B's on the island as well if you prefer those style of accommodations. 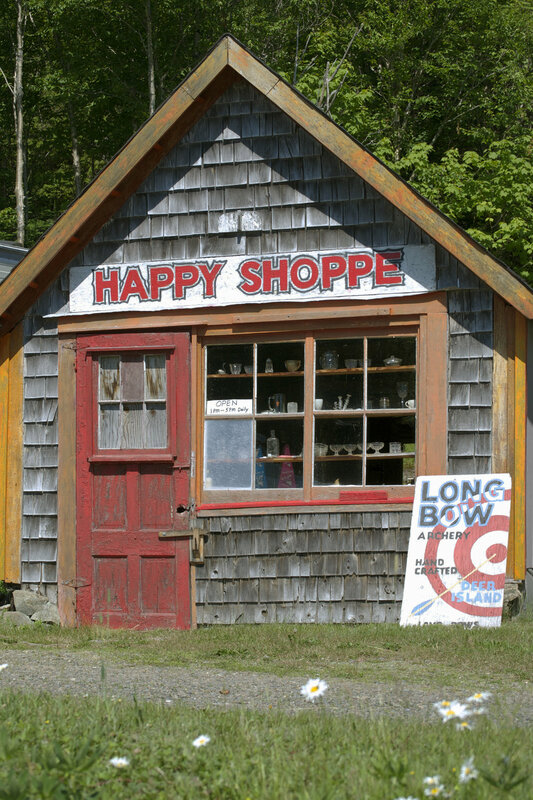 Enjoy a meal at the licensed restaurant or at a local diner, pick up an artwork or an artisan treasure at one of the many art galleries or gift shops, or find a good used book or antique treasure at a roadside shop, or buy some treats at a general store, then tell two friends about Deer Island. Deer Island Point Park & Campground, is a picturesque place to camp and it one of the best places to enjoy scenic ocean vista views - perhaps you might even spot a whale or seal too. Mother nature serves it all up here. It is also the site of 'Old Sow' ~ the largest known tidal whirlpool in the Western Hemisphere (second largest in the world)! It was all calm & quiet when we were here but we were told 'Old Sow' is unwilling to disclose all her mysteries from afar. It is no joke either, as it is said this whirlpool can boil with treacherous 'walls of water', when heavy winds and high tides combine. It has been described as 'liquid chaos' and there are many stories that have been shared over the years of swallowed boats, near death experiences and worse, when lives and vessels were sucked into 'Old Sow', never to return. So, enjoy the view from the shore, the best time is during high tide, and give this area the respect it deserves, as even experienced sailors and fishermen will attest, you are no match for her fury when caught in 'Old Sow'. The 45th Parallel Restaurant is almost the only show in town, but it is a darling! Home-cooked meals with seafood of course, is the specialty. The owner Diane Bustin, is a hoot, giving you the story behind anything you want to know, including that her place is the longest running established dining facility (and motel) on Deer Island and her restaurant has been recommended as one of the top places to eat in Canada. Not too long ago, a huge film crew set up with tons of equipment and drone cameras to capture her restaurant as part of a tourism video, (that is now shown in theatres we were told). Diane is a proud owner and truly a wealth of local information, if you need directions or if you are just are wondering about something local. Don't hesitate to ask but be prepared to be entertained. 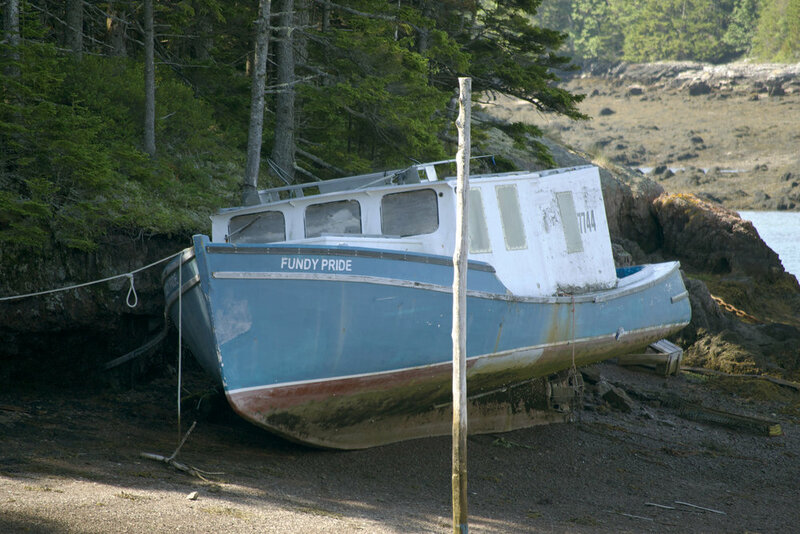 My husband did just that when he enquired why the local ferry wasn't running to Campobello Island this summer, and Diane leaned in and gave us the 'real scoop'. Diane is a character and she runs a tight ship. Her kitchen crew is efficient and her place is dressed to impress in a charming red & white country gingham decor. Diane shared she's been running this place for over 30 years, and has to hang onto it a bit longer as a 10-year-old granddaughter has aspirations of following in her footsteps. So, doing the math ~ given her successor's dream, the 45th Parallel Restaurant should be around for at least another 30+ years and then some. 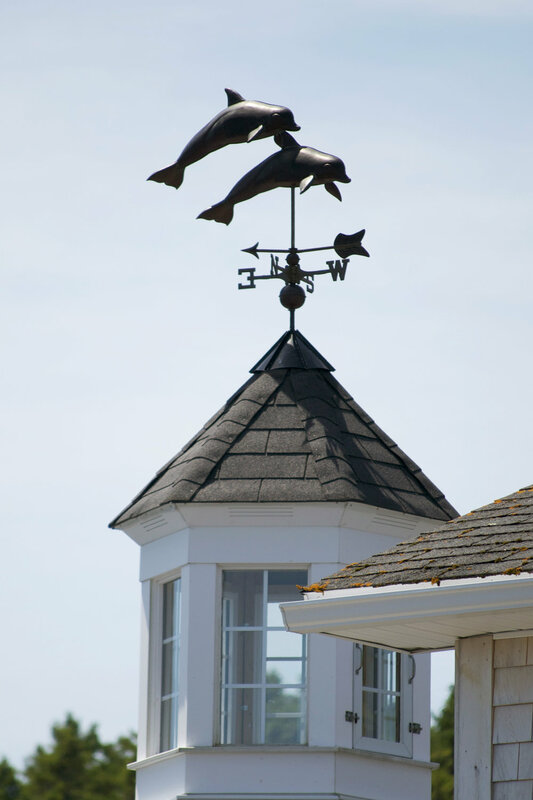 Stop in, catch up on the island's news and enjoy a lobster roll and chowder in this little charmer on the hill above Fairhaven, over-looking the Western Passage. As I shared earlier, reading more on this little serene island, that captured my heart on our daytrip journey, had me wanting to return as soon as possible to find more of the tourism highlights we didn't get to see. I would love to stay for a few days and speak to the locals to explore the hidden beaches and special places they enjoy most. However, that being said, no research is truly needed to enjoy this natural wee wonder. My husband and I had a glorious day, just driving and stopping whenever something caught our eye, on this impromptu trip, that took our breath away ~ around every corner we turned. 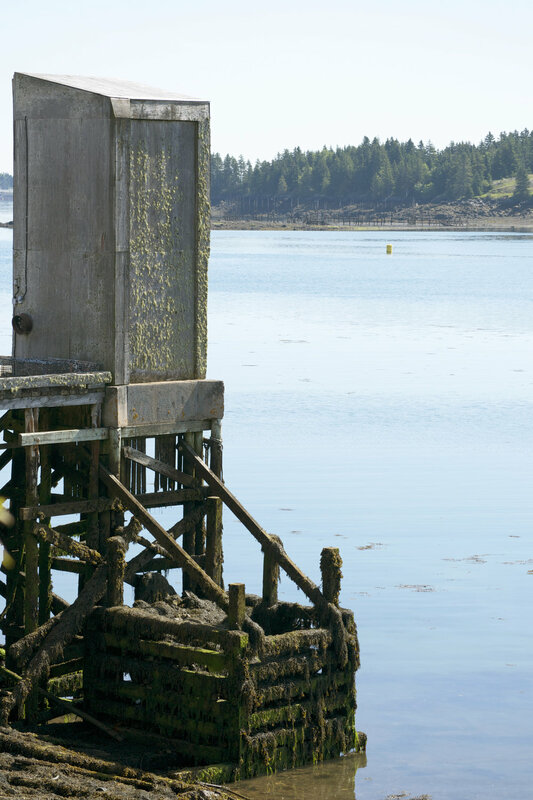 So catch the ferry - (there's no charge) and it runs every 30 minutes from 6 a.m. to 10 p.m. Get out and take in the views on the short 20-minute trip then prepare to be 'wowed' on the smallest Bay of Fundy island with the grandest views.